The imagination of children is a door to a bigger, fun and more exciting world than the one they see. It is the pathway to possibilities, a place where creativity, ingenuity, and thinking outside the box begins. For young children, imaginative play is how they learn about the world around them. Through playtime, they manipulate materials, express themselves, plan, act, interact and try all kinds of different roles. By playing, and putting themselves in different types of situations, they develop their problem-solving skills, and in that way, they pave the way to becoming more initiative and innovative in future. While in play mode, the best companions for your children, (apart from other kids) are their toys. Children spend a large amount of time touching and manipulating their toys, so you need to make sure that they are safe, durable, and engaging. Wooden toys are a great example of all that. Unlike their plastic counterparts, wooden toys are free of unwanted chemicals and toxins and are safe for your child to constantly use, play with and even chew. What makes the wooden toys even more convenient and helpful in the child’s development process is that they can also be interactive. 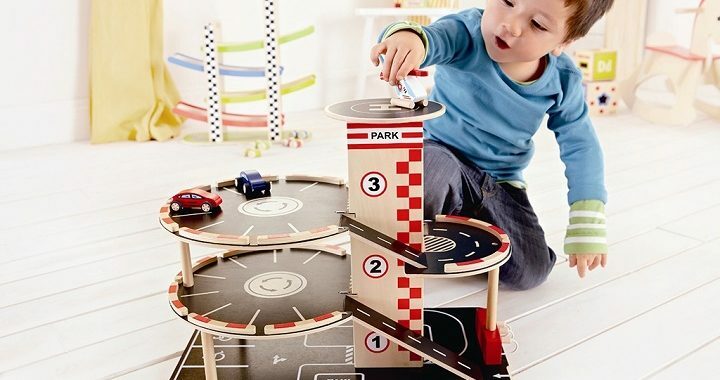 These types of movable and interactive toys, like childs wooden garage toy or a service station parking garage toy, can encourage fine motor skills, hand-eye coordination, and patience. These types of toys additionally challenge the child’s mind and improve their memory skills. One other fact that every parent should have in mind is that children are curious and have the tendency to put things into their mouth in order to familiarize themselves with them. While all this is fun and games for the child, the parent should be aware that if the toy can easily be easily broken, small edgy parts can be swallowed which can choke the child. The durability wooden toys provide can give you some piece of mind because in spite of all the battering and moving around the childs wooden garage toy, wooden vintage kitchen set, baby changing table or any other wooden toy for that matter, won’t be destroyed and torn apart. If all this was not beneficial enough, wooden toys are additionally even environmentally sound. They are made from sustainably sourced certified wood and are a much more environmentally friendly option than plastic toys. So, that makes wooden toys biodegradable and recyclable. Moreover, these wooden garages, ships, doll houses and what not, will grow with your child. Toddlers and preschoolers usually use them in more simple ways, but as they grow up, you can expect them to incorporate their favourite wooden toys into more complex imaginative situations.